The Lancaster Area Paralegal Association (LAPA) is once again participating in State Representative Mike Sturla’s Annual Back to School Giveaway, to be held at the Lancaster Recreation Commission on Saturday, August 23. 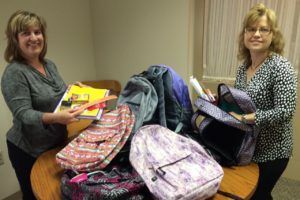 GKH paralegals Susan Miller and Jennifer Marcus with some of the 18 backpacks donated to LAPA. The giveaway provides backpacks filled with school items to local students. GKH litigation paralegal Susan Clarke, who serves as LAPA’s Community Relations Chair, helped coordinate LAPA’s involvement with this year’s giveaway. LAPA collected 45 complete backpacks and many additional supplies. GKH also partnered with LAPA and provided 18 complete backpacks for the giveaway. In addition, GKH joined with Atlee Hall and Dougherty Office Supply to provide 100 fully-equipped backpacks to the Lancaster City School District.